Insights on trends in number of US patients diagnosed with Diabetes and percentage of population with Diabetes and Obesity. 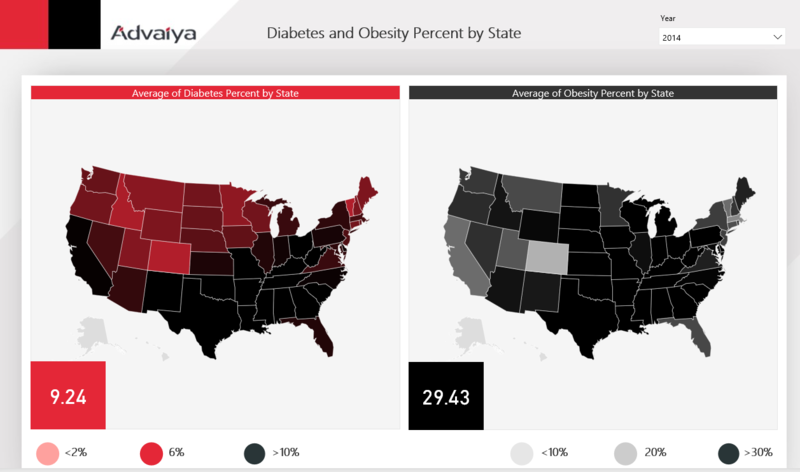 Easily identify best and worst States in terms of Diabetes and Obesity prevalence through map based visuals and analyze the correlation between Diabetes and Obesity. 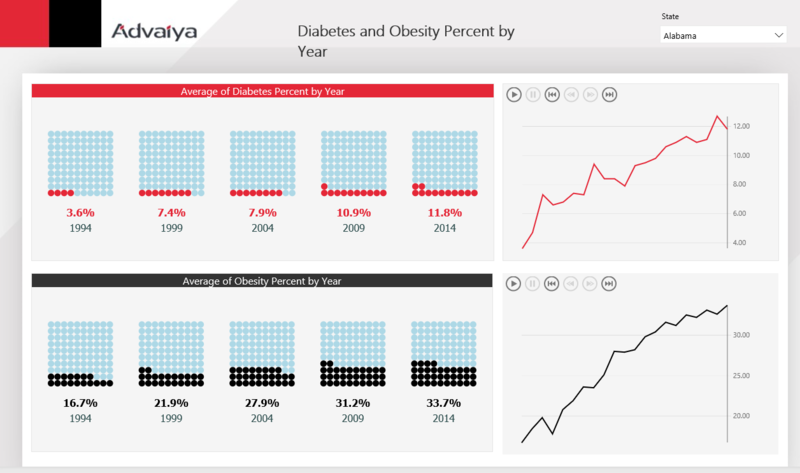 •The trends in number of patients, Diabetes and Obesity percent – overall and by State. •Worst and best states in terms of current number of patients, Diabetes and Obesity percent. •Correlation between Diabetes and Obesity. After formatting the data in the Excel file to enable plotting the trends, the data was imported into Power BI Desktop file. 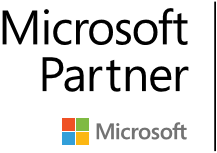 Report pages were created to provide quick insights. •A trend chart shows the number of patients diagnosed with Diabetes by year. Five shape maps for 5 year increments from 1994 to 2014 use a common legend across the five for the number of patients to show the growth and highlight the states with least and most number of patients. •The number of patients in any state is probably just representative of the population of the state rather than the extent to which Obesity and Diabetes are spread across the state. Hence it is important to look at the percent of people with Diabetes and Obesity rather than the raw numbers. Bar charts showing the states in a descending order of the average percentage of people with Diagnosed Diabetes and Obesity enable a quick identification of best and worst states. 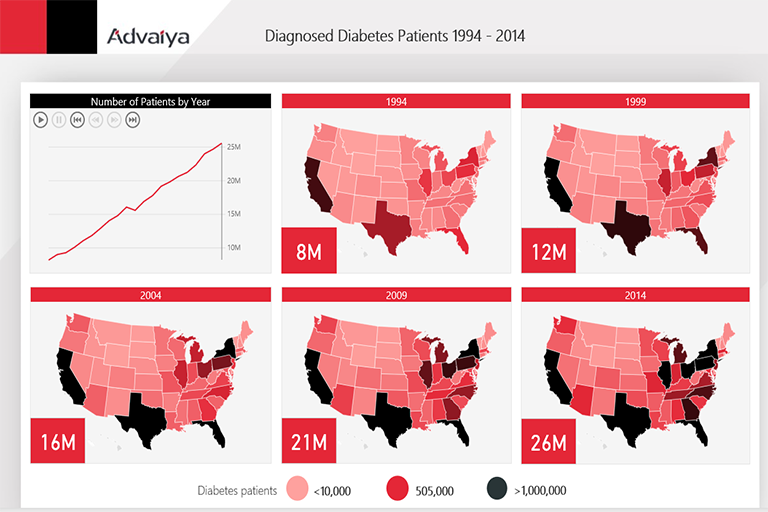 •Other visualizations using Shape maps and waffle charts show how the Diabetes and Obesity have grown over the years and across the states. •A scatter-plot and a calculated measure depict the strong correlation between Diabetes and Obesity.